Katok Dampa Deshek (Tib. ཀཿཐོག་པ་དམ་པ་བདེ་གཤེགས་, Wyl. 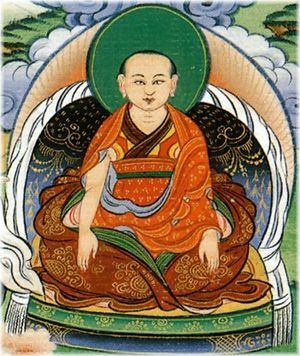 kaH thog pa dam pa bde gshegs) (1122-1192) — founder of Katok Monastery. His eldest brother was Phagmodrupa Dorje Gyalpo, one of the main students of Gampopa. Dampa Deshek's teachers included Phagmodrupa, the Sakya patriarch Sönam Tsemo, Dzamtön Drowé Gönpo, a disciple of Zur Shakya Senge, and the first Karmapa, Düsum Khyenpa. He founded Katok in the earth rabbit year, 1159. His extant writings include commentaries on the Sutra Gathering All Intentions (Tib. Düpa Do). This page was last edited on 7 July 2018, at 22:57.